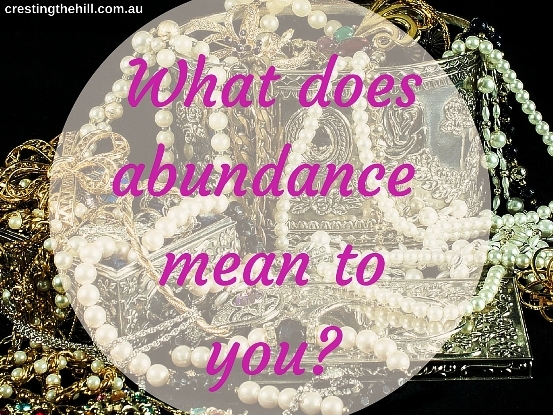 I was thinking about what a rich and meaningful word "abundance" was......and then I got to thinking how the meaning of "abundance" changes depending on your world view and what you consider to be important in life. So many people tie the thought of abundance up with wealth and riches and all the little luxuries that having lots of money can buy. But is that what abundance is really all about? Does having more money than you know what to do with give you a depth and richness of character? Can owning piles of money really fulfill your life? The other "abundance" that I came across was the use of the word in positive affirmations and wishing abundance on yourself by declaring your worth and expecting good things to be heaped upon you by a benevolent universe. But is that really how life works? Can we just make wild and wonderful statements and expect everything to come up roses for us all the time? 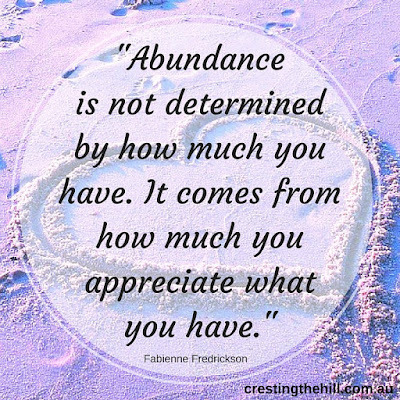 I have a different view of abundance. I think it's about seeing all that you already have and realizing that it is often more than you need. Acknowledging that you have been blessed with so much and showing appreciation for it. It's not about money, it's about family and friends, warmth and comfort, love and connection, and so much more. When we stop and take stock of how rich and full our lives are (regardless of how much money we have in the bank) then we start to have a sense of how well off we truly are. We live, for the most part, in an age of abundance where we have so many choices and so many good things and yet we show so little appreciation for them. We often overlook our own abundance when we are envying others and what we think they have that we are missing out on. Perhaps it's time to look into our own hearts and see if we are showing gratitude for having more than we need. Maybe we need to look away from what the world tells us we should be piling up, and instead focus on being grateful for the abundance we already have and then sharing some of that with those who have a little less than us. Sharing our time, or our talent, or our knowledge, or our love - the things in life we have plenty of already and can afford to give away. Such a very true post. I am living in a country that is in the middle of a crisis and yet I thank my lucky stars that I have my health, and certain other freedoms that others, such as those poor refugees who are forced to leave their homes, do not. Also having this blog has made me see what an abundance of will I have and how I can develop my creativity even more. Yes, and most importantly we always have to give back in any way we can. Thank you Leanne for giving me my daily does of calm and sanity. my pleasure Mary - I have seen a fair bit about Greece and it's economic woes on the news, and also all the refugee problems Europe is facing - the world is getting to be a scary place and it is so important to focus on the good stuff where we can. Abundance to me is a full life and a life full of love. So much love. It has nothing to do with economics for me, anyway! I totally agree with your view on abundance - it's all about recognizing and appreciating the many blessings we already have, and expressing gratitude for them. This is the attitude I'm trying to cultivate with my weekly focus on gratitude. Thank you for sharing your thoughts! I love your gratitude posts Laurel - I think it's so important to stop and take stock of the good things in our life and appreciate how blessed we are. I love this Leanne. For so many years I only lived for tomorrow. "We'll have more tomorrow," "We'll make more money tomorrow. It wasn't until I got sick and nearly died that I learned what is really important in life! I did the same thing Rena - I kept waiting for the next job that would bring in the money or for things to all be smooth sailing - I've also realized that we need to look at the good stuff we have now and stop being dissatisfied all the time. I LOVE that LuAnn - to be filthy rich in family and friends should be everyone's goal in life! I'm off to check and make sure I'm following it! A lot of truth in this post. Once you realize that you are blessed, truly do have all that you need, then life is so much happier and easier to live. that is the whole thing in a nutshell Kathy - we have so much to be grateful for and we often miss it because we are always looking for more! Since I'm a sucker for inspirational quotes I love to come to your blog Leanne and do some thinking. Yes, you're so right - we have much more to give than we think. And most of the time it's free: it's a little gesture, help, appreciation, a hug - and these things don't cost anything. Recently, I got introduced to a website where we can help rescue animals at https://www.thedodo.com. I visited the website with a broken heart and realised that we could do so much for all these helpless creatures and yet most of the time we just choose to ignore it and look away, pretend we don't have much to give away. Thank you Leanne for making us realise that we have more than enough! You are so right, Leanne. Sometimes we completely lose perspective and fail to realize all that we have right in front of us. Gratitude and appreciation are key to living a truly "rich" existence. I have wasted an awful lot of time wishing for more Lee - now I take it day by day and realize I pretty much have it all if I change my perspective just a little. I totally agree Leanne. Abundance is not material things but family, friends and love. Thanks for another well written post and sharing with us at #WednesdaysWisdom.